« Workshops with John Bell – Joyful Voices for Hope & Change! 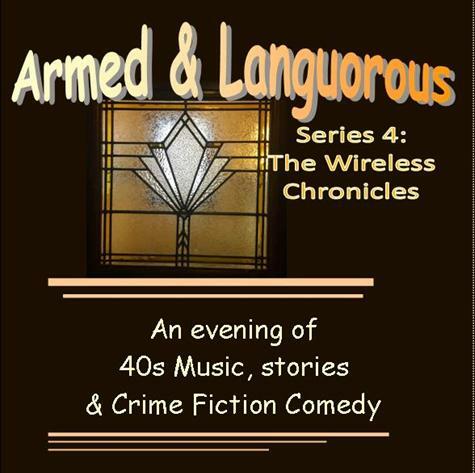 An evening of music, stories and crime farce set in the 1940s. Written by local Playwright and Author Maureen O’Brien, delivered with a troupe of 6 players and musicians, all sharing the various voices. Audience participation is encouraged. Although WWII accounted for the first half of the 40’s, our crooks found plenty of innovative ways to turn an illegal quid and as we move into the post-war era some new characters emerge to play both sides of the fence. We traverse between parliament house, police headquarters, the Duck for Cover Club and flavour the antics with Fat Freddy’s pie shops. Don’t miss this series where the antics get frantic. … In this series of The Wireless Chronicles – Armed and Languorous – we see some new characters joining the farcical flock which has been finding innovative ways to turn an illegal quid during the war years. We meet up with the bent bunch at the announcement of peace and discover that there’s been quite a few changes. And some devious new doings. As we traverse between parliament house, police headquarters, the Duck for Cover Club, and – the pie shop?! – we meet a few new characters playing both sides of the game. Get ready for a new batch of laughs. 2pm Saturday 1 June at The Dungeon. The Wireless Chronicles is a series of four live shows set as a live broadcast from a radio station during the 20s, 30s, 40s, 50s. Each show comprises: Music and stories of the people and times from each decade; interspersed by 6 consecutive episodes of a Radio Play set in Sydney during the decade – a Crime Farce based around the ongoing escapades of Squiffy Naylor [4th cousin 6 times removed of infamous Melbourne gangster Squizzy Taylor] and his gang of misfits, local brothel and bar owner Fifi La More, and her paramour Faulkner of the Constabulary, along with various questionable characters.